I will be hosting Dr. Ed Stetzer’s (President of LifeWay Research) webcast “The Exchange” as part of a test syndication. 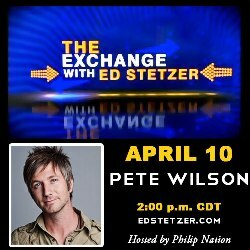 Today on “The Exchange” Pete Wilson, pastor of Cross Point Church in Nashville, discusses his newest book Empty Promises: The Truth about You, Your Desires, and the Lies You’re Believing. Philip Nation, Director of Ministry Development at LifeWay Christian Resources, will be guest-hosting. Click the image below to start the webcast at 2pm cst/3 pm est! Every single time I try to watch The Exchange, I forget that Nashville is in the Central Time Zone. It’s always the same sequence: Go to lunch, come back, work for about an hour, open up the webcast, and then see that I’ve still got an hour to go until 2:00 CTS. Does the SBC have enough pull to move the city of Nashville a little closer to the East Coast? Zack, they really should move into the eastern time zone since that’s what the world runs on! Previous post: Congratulations Bubba Watson for Winning the Masters!